For other uses, see Lost Generation (disambiguation). In his memoir A Moveable Feast (1964), published after Hemingway's and Stein's deaths, Hemingway writes that Stein heard the phrase from a French garage owner who serviced Stein's car. When a young mechanic failed to repair the car quickly enough, the garage owner shouted at the young man, "You are all a "génération perdue. ":29 While telling Hemingway the story, Stein added: "That is what you are. That's what you all are ... all of you young people who served in the war. You are a lost generation. ":29 Hemingway thus credits the phrase to Stein, who was then his mentor and patron. The writings of the Lost Generation literary figures tended to have common themes. These themes mostly pertained to the writers' experiences in World War I and the years following it. It is said that the work of these writers was autobiographical based on their use of mythologized versions of their lives. One of the themes that commonly appears in the authors' works is decadence and the frivolous lifestyle of the wealthy. Both Hemingway and Fitzgerald touched on this theme throughout the novels The Sun Also Rises and The Great Gatsby. Another theme commonly found in the works of these authors was the death of the American dream, which is exhibited throughout many of their novels. It is particularly prominent in The Great Gatsby, in which the character Nick Carraway comes to realize the corruption that surrounds him. The term is also used in a broader context for the generation of young people who came of age during and shortly after World War I. Authors William Strauss and Neil Howe define the Lost Generation as the cohort born from 1883 to 1900, who came of age during World War I and the Roaring Twenties. In Europe, they are mostly known as the "Generation of 1914", for the year World War I began. In France, the country in which many expatriates settled, they were sometimes called the Génération du feu, the "(gun)fire generation". In Great Britain, the term was originally used for those who died in the war, and often implicitly referred to upper-class casualties who were perceived to have died disproportionately, robbing the country of a future elite. Many felt that "the flower of youth and the best manhood of the peoples [had] been mowed down," for example such notable casualties as the poets Isaac Rosenberg, Rupert Brooke, Edward Thomas and Wilfred Owen, composer George Butterworth and physicist Henry Moseley. Members of the Lost Generation include F. Scott Fitzgerald, Gertrude Stein, Ernest Hemingway, T.S. Eliot, Ezra Pound, Jean Rhys and Sylvia Beach. ^ Hynes, Samuel (1990). A War Imagined: The First World War and English Culture. London: Bodley Head. p. 386. ISBN 0 370 30451 9. ^ Madsen, Alex (2015). Sonia Delaunay: Artist of the Lost Generation. Open Road Distribution. ISBN 9781504008518. ^ Fitch, Noel Riley (1983). Sylvia Beach and the lost generation : a history of literary Paris in the twenties and thirties. WW Norton. ISBN 9780393302318. ^ Monk, Craig (2010). Writing the lost generation: expatriate autobiography and American modernism. University of Iowa Press. ISBN 9781587297434. ^ a b c Hemingway, Ernest (1996). A Moveable Feast. New York: Scribner. ISBN 0-684-82499-X. ^ Mellow, James R. (1991). Charmed Circle: Gertrude Stein and Company, p,273. New York: Houghton Mifflin. ISBN 0-395-47982-7. ^ Mellow, James R. (1992). Hemingway: A Life Without Consequences. New York: Houghton Mifflin. ISBN 0-395-37777-3. ^ a b Baker, Carlos (1972). Hemingway, the writer as artist. Princeton, N.J: Princeton University Press. ISBN 0-691-01305-5. ^ "Hemingway, the Fitzgeralds, and the Lost Generation: An Interview with Kirk Curnutt | The Hemingway Project". www.thehemingwayproject.com. Retrieved 30 March 2016. ^ "Lost Generation | Great Writers Inspire". writersinspire.org. Retrieved 30 March 2016. ^ "American Lost Generation". InterestingArticles.com. Retrieved 30 March 2016. ^ Howe, Neil; Strauss, William (1991). Generations: The History of Americas Future. 1584 to 2069. New York: William Morrow and Company. pp. 247–260. ISBN 0-688-11912-3. ^ Wohl, Robert (1979). The generation of 1914. Cambridge: Harvard University Press. ISBN 978-0-674-34466-2. ^ "The Lost Generation: the myth and the reality". Aftermath – when the boys came home. Retrieved 6 November 2009. ^ Winter, J. M. (November 1977). "Britain's 'Lost Generation' of the First World War" (PDF). Population Studies. 31 (3): 449–466. doi:10.2307/2173368. JSTOR 2173368. ^ "What was the 'lost generation'?". Schools Online World War One. BBC. Retrieved 22 March 2012. ^ Esguerra, Geolette (9 October 2018). "Sartre was here: 17 cafés where the literary gods gathered". ABS-CBN News. Retrieved 15 March 2019. ^ Thompson, Rachel (25 July 2014). "A Literary Tour of Paris". The Huffington Post. Retrieved 15 March 2019. ^ Monk, Craig (2010). Writing the Lost Generation: Expatriate Autobiography and American Modernism. University of Iowa Press. Doyle, Barry M. "Urban Liberalism and the ‘lost generation’: politics and middle class culture in Norwich, 1900–1935." Historical Journal 38.3 (1995): 617-634. in Great Britain. Fitch, Noel Riley (1985). 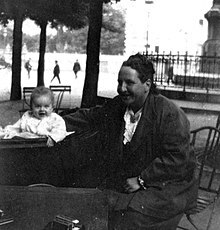 Sylvia Beach and the Lost Generation: A History of Literary Paris in the Twenties and Thirties. Norton. ISBN 0-393-30231-8. Winter, Jay M. "Britain's ‘Lost Generation’ of the First World War." Population Studies 31.3 (1977): 449-466. online, covers the statistical and demographic history.